Indigo is from young leaves of the leguminous indigofera tinctoria plant harvested during the annual monsoon. Indigo leaves are gathered and soaked in vasts overnight. 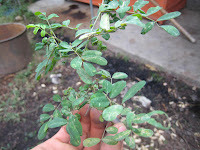 The leaves are removed the next day and lime is added to the indigo. The mixture is ready for dying. 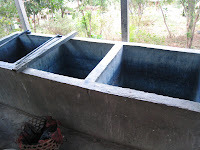 As the threads are soaked in the indigo water, the threads will turn green and as they oxidize they will turn blue. 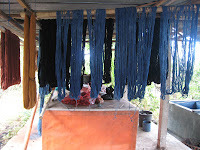 It takes many applications of dye to make the threads a deep blue. 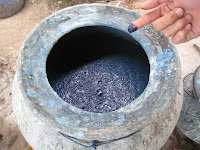 Good dyers can make up to ten shades of indigo. 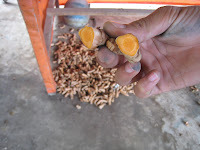 Kunyit (Tumeric), the bark of Kayu Nangka (Jackfruit tree) and the bark of the mango tree are used to make a yellow colour. 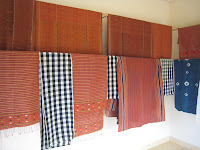 Brown comes from the Sidawaya flower (Wood fordia floribunda) and Kayu Santen. 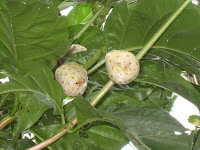 The red dye is from the small roots of morinda citrifolia　tree. 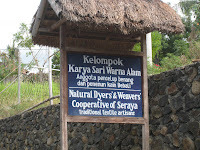 The most difficult part of this process is the mordanting or preparation of the threads before they are dyed red. Kemeri or candlenut is used in the mordant process to produce the metallic salts along with plant materials that are high in aluminium. 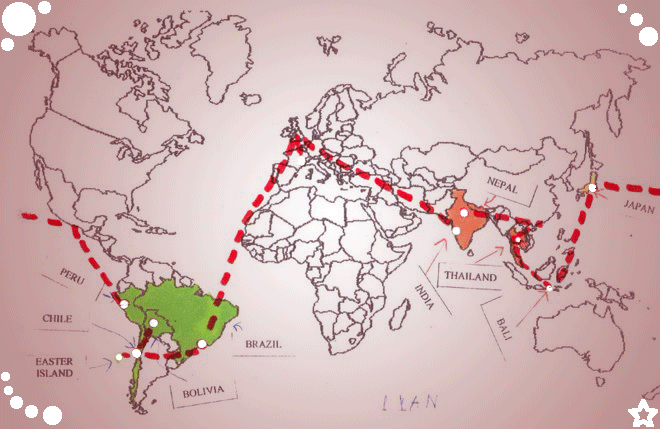 The mordant process can take up to three months. 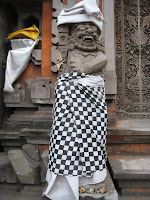 The Poleng textile can be seen used everywhere on Bali as a wrapping on shrines, large trees and statues. The Poleng is said to represent balance; the black being chaos and the whits order. Too much chaos leads to destruction; too much order leads to stagnation. Life finds balance between these forces.